The property is situated on the edge of the village of Sandbank which lies on the southern shore of the Holy Loch and is only 5 minutes by car from Dunoon, the principal town of the Cowal Peninsula, with its famous Victorian pier and promenade. 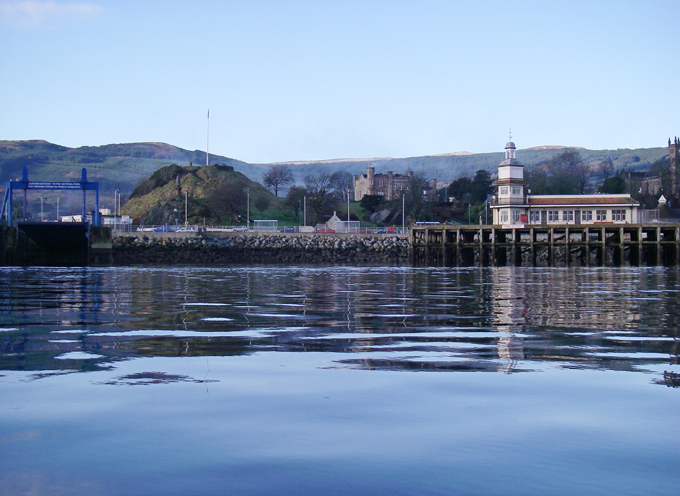 Dunoon has a selection of restaurants, cafes, shops, food takeaways and a cinema and it is also home to the world famous Cowal Highland Gathering, the Royal National Mod and the Cowal Walking Festival. Sandbank is at the southern gateway to the Argyll Forest Park and the Loch Lomond and The Trossachs National Park beyond. Watched over by the Arrochar Alps and bordered by sheltered sea lochs, the spectacular scenery of the Cowal Peninsula contains the magnificent stretch of rugged hill country comprising the Argyll Forest Park which was the very first Forest Park for public enjoyment established in Britain in 1935. 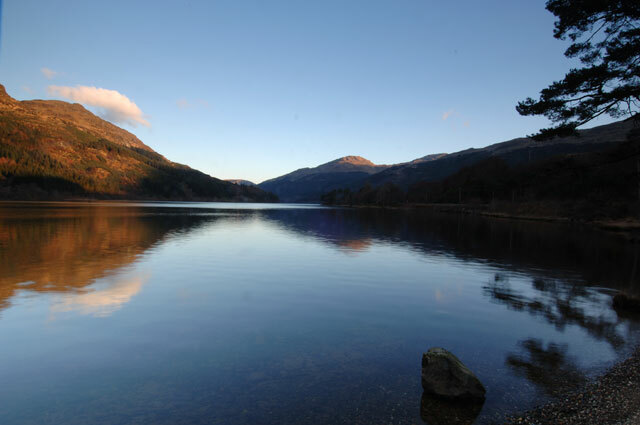 Many visitors who have come to know the Argyll Forest Park, and its mountains, glens, lochs and woodlands, claim that this first park is also the finest of them all. Perfect for those looking for a quiet location, but within easy reach of nature trails, picnic spots, fishing, stalking and great touring, it is a breathtaking rural location for those who wish to escape, relax and see Scotland in its true beauty. The stunning but peaceful waters of Loch Eck and its surrounding hills are less than 10 minutes drive from the property. The scenery in the Cowal Peninsula is amongst the most beautiful in Scotland, and the area is home to the botanical gems of Benmore Botanic Garden and Ardkinglas Estate and Woodland Garden, which has one of Britain’s tallest trees (competition for official recognition of Britain‘s tallest tree is fierce and another competitor tree is to be found nearby in Glendaruel near Dunan’s Castle.) There are numerous scenic forest and hill walks, with spectacular views of the Argyllshire Hills, the Arrochar Alps and the Clyde and Kintyre coastlines. For the naturalist, the area abounds with wildlife including deer, seals, otters, red squirrels and many varieties of birds, including herons, buzzards, harriers, lapwings, oyster catchers and hawks. Red squirrels, greater spotted woodpeckers, swallows and jays can regularly be seen in Fasgadh’s garden and, in recent summers ospreys have been seasonal visitors and have been seen from Fasgadh at the head of the Holy Loch. The Kilmun Aboretum was established in the 1930s as the Kilmun Forest Research Plots to monitor the success of a variety of exotic tree species in the humid Scottish west coast environment. Due to the large variety of species, mostly conifers and planted in groves, the autumnal changes bring a delightful and interesting profusion of contrasting colours. The Arboretum is laced with footpaths which give not only beautiful but unique walks in Scotland because you can see 162 tree species planted not just as individuals but as groups forming “mini forests“. You will see not just, for example, ‘a’ Monkey Puzzle Tree or ‘a’ Mountain Hemlock, but groves of such remarkable trees drawn from all around the world. The magnificent landscape of the Loch Lomond and The Trossachs National Park has fired the imagination of writers and artists for centuries. It embraces the deep waters of Loch Lomond, where the formidable Ben Lomond stands guard over Loch Lomond, the largest expanse of freshwater in Great Britain; the wild glens and sparkling lochs of the Trossachs between Callander and Aberfoyle; Breadalbane’s high mountain country to the north, with some of Scotland’s finest Munroes (mountains over 3000 ft), Ben Lui, Ben Challum, Ben More and Ben Vorlich; and the sheltered sea lochs of the Argyll Forest. On the Isle Of Bute, Mount Stuart House is only one hour away by road and a short ferry crossing across the famous Kyles of Bute. During the nineteenth century Britain witnessed a Gothic architectural revival. Across the land buildings rose, Cathedral like, as monuments to an obsession with the medieval past. 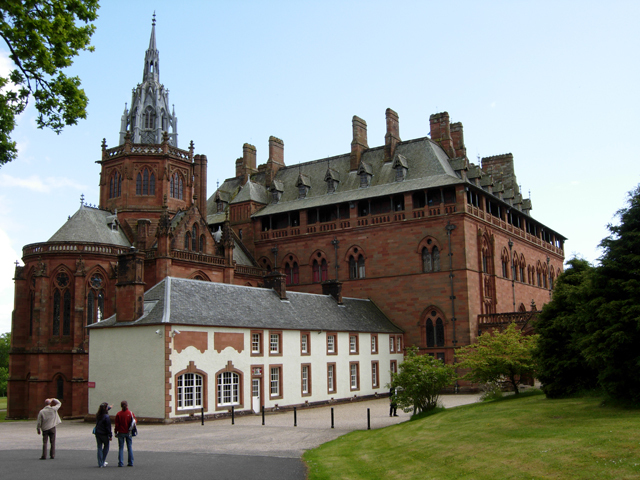 Mount Stuart is arguably the finest piece of domestic architecture to come out of this movement. 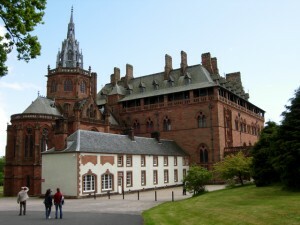 In 1877 the heart of the old Mount Stuart, a building of the reign of Queen Anne, was destroyed by fire. Under the direction of the 3rd Marquess of Bute and his architect Sir Robert Rowand Anderson, a new house arose from the ashes of the old – a Gothic palace which fused powerful architecture with intricate details and lavish designs. Yet the house was never finished, much only being completed in an ambitious restoration programme begun by the late 6th Marquess in the 1980s, a programme which continues to this day. The high road to Tighnabruaich provides wonderful views over the Kyles Of Bute and a panorama of the Clyde coastline from the Ayrshire shore through the mountains of the Island Of Arran to the Mull of Kintyre. The roads of Argyll are quiet and well maintained, which makes driving or cycling relaxed and enjoyable experiences. The location makes an ideal base for exploring the Argyll Forest Park, Loch Lomond and Trossachs National Park, Argyll (including Kintyre, the SW islands (especially Gigha, Mull and Iona) and Glencoe. Glasgow (for a complete change of pace in a vibrant major city with famous shopping, theatres, restaurants and museums (many of which offer free entrance)); Oban (for a visit to the Isles of Mull and Iona) and Stirling (Wallace Monument, Stirling Castle and the famous Falkirk Wheel) are all within two hours travel by road. 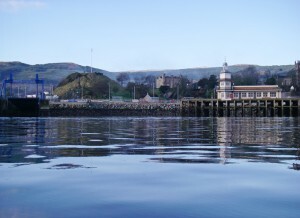 There are ferry links from Dunoon to train and bus services to the Braehead Shopping Centre and Glasgow for those who wish to go shopping or seeking city life without taking the car. The renowned archaeological centre at Kilmartin and the famous Crinan Canal are a pleasant day trip away.